To the east of the Large Library is the Blue Room. The name comes from the panels of blue silk damask that hung on the walls in the latter half of the nineteenth century. The plaster ceiling dates from 1774-1775 and has been attributed to either Vincenzo Valdrè or Giovanni Battista Borra. It is decorated with emblems of Bacchus, including four thyrsi surrounding an ornate jug, with a handle in the form of a Satyr, encircled by a wreath of vine-leaves and grapes. The four corners have reliefs of Venus, Flora, Vulcan and Venus (again). A comparison of photographs taken in about 1870 (see top of page) and also in 1921 shows the same decorative scheme. Since the School has occupied the building it has been known variously as Class Room no 1; Grenville West Houseroom and now the Blue Room. 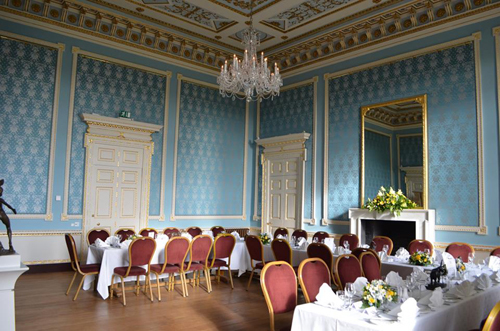 It is currently used as a reception room for small meetings and dinners. 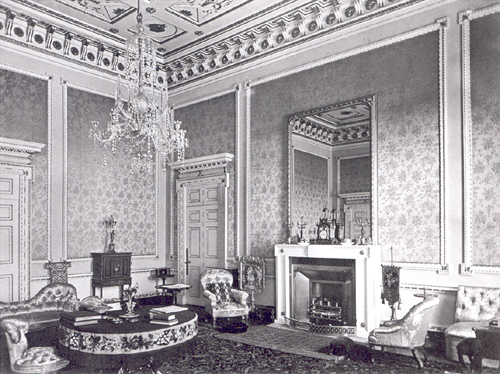 The ceiling and cornice have been restored by the School and it is known that the present chimneypiece was transferred to this room from the Music Room in 1987. Graffiti on the upper face of the NW doorcase suggests that the room was painted in 1966 and 1988, although it is thought that the ceiling may have been decorated on only one of those two occasions. 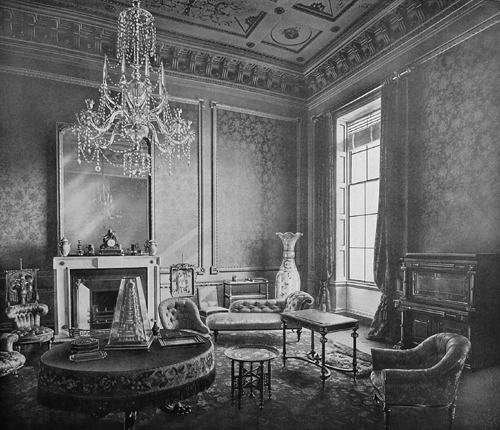 The room has been partially decorated on as many as eight occasions, and original gilding survives on the ceiling and cornice. There is a curious mismatch between the ceiling and the wall surfaces and the walls and the joinery. 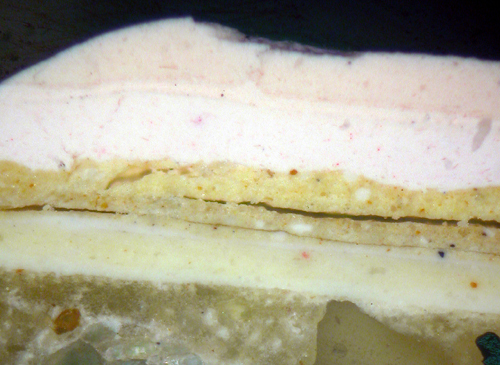 It appears that, although eighteenth century paint layers can be found on the ceiling and joinery, the walls may have been re-plastered in the late eighteenth century. It is certainly clear that the ceiling was originally decorated with a combination of off-white and pale pink and the joinery was painted off-white and heavily gilded. 1 Source – Michael Bevington. Stowe House. Paul Holberton Publishing. 2002. 2 The iconography of the decorative plasterwork suggests a room for eating in. 3 It is not known whether it was both the silk wall panels and the curtains that were sold, or just the latter. The Stowe House Preservation Trust was founded in 1997 in order “to restore and preserve Stowe House for the benefit of the nation and the public.” The school remains as a tenant and the house is opened to the public on more than 200 days per year.